The Impressionist movement in painting is associated most with Southern climes. Painters like Claude Monet, Paul Cézanne. Éduard Manet and Camille Pisarro gravitated toward Provence where they could paint outside, capturing the vibrant colours and stark contrasts of light and shade provided by sun-drenched landscapes. Yet the impact of Impressionism was immense, touching artists all across Europe and around the world. It influenced painters in many northern countries, including not-so-sunny Britain. James MacNeill Whistler is credited with bringing Impressionist techiniques to England from France in 1863. His pupils, Walter Sickert and Wilson Steer organized the first exhibition of British Impressionists in 1889. The 606 by Michael Alford. Now on show in Three British Impressionists, Panter & Hall. Today, Impressionism isn’t so much a movement as an attitude toward painting and a set of liberating tools. Many painters employ Impressionist approaches, such as painting en plein air, painting at twilight or at night, and depicting scenes of ordinary life, without calling themselves Impressionists. A good example of the lasting influence of Impressionism can be seen in the current exhibition, Three British Impressionists, curated by Panter & Hall. 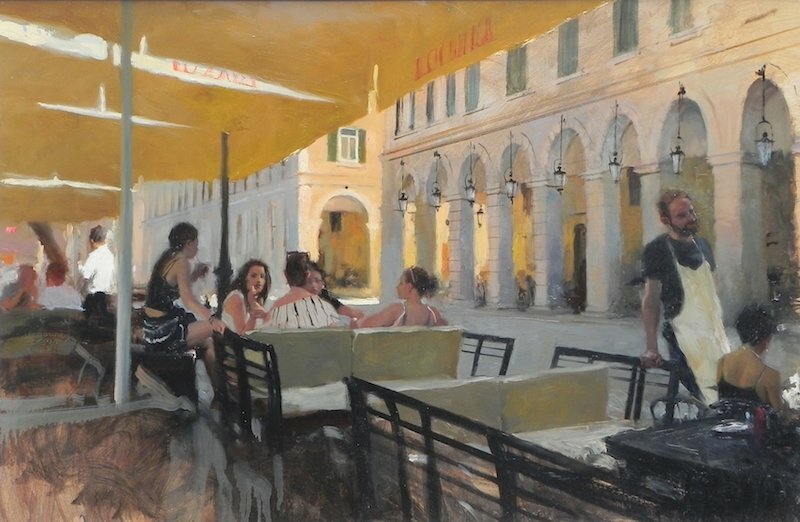 The show, which features works by Michael Alford, John Martin and Richard Pikesley, reveals three very different painters, each using Impressionist principles—along with other influences—in pursuit of a contemporary artistic vision. Three British Impressionists shows from 29th June-14th July, 2017 at Panter & Hall, 11-12 Pall Mall, London. 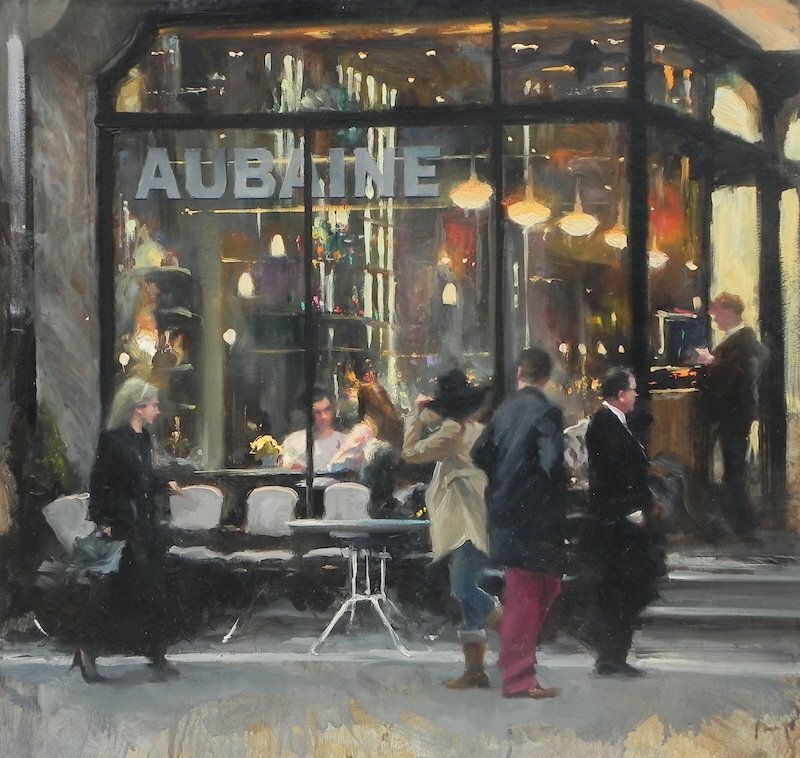 The Art of Conversation, Aubaine by Michael Alford. 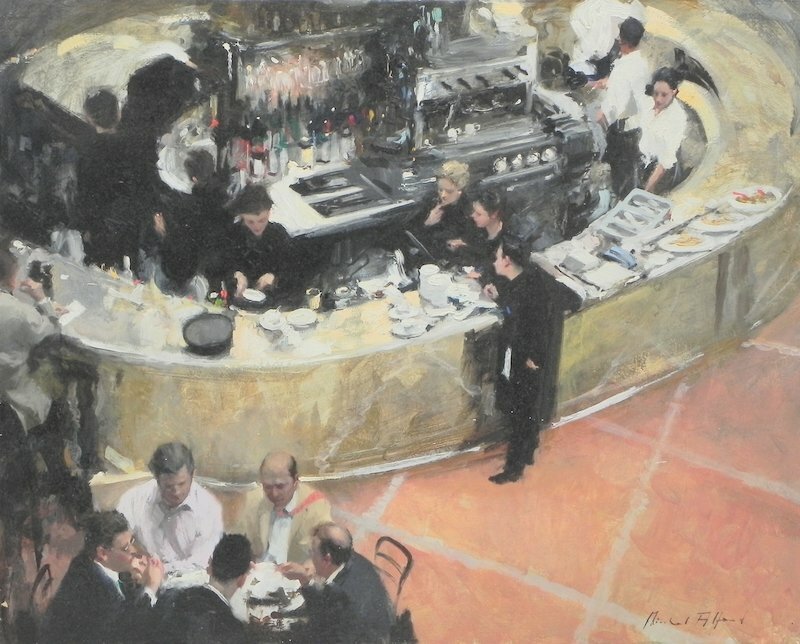 City Lunch, 4 by Michael Alford. Strand, Window Shopping by Michael Alford.